Our 2016 Youth Apprentices at the Oberia D. Dempsey Multi-Services Center in Harlem. Our 2016 Summer Public Art Youth Employment Program started on July 5th with an orientation at the Oberia D. Dempsey Multi-Service Center in Harlem. Over the course of six weeks, Youth Apprentices will be paid to participate in six mural projects and to contribute to two multi-media or graphics projects at six partner locations. Read on for details about each site. We invite you come out to our four public worksites to meet these dynamic young people and to observe their work as it progresses. Youth Apprentices will be working from 9:30 to 4:30, Monday through Thursday, throughout July and the first week of August. We will be holding unveilings during the second week of August. You can read more about these events as the dates draw closer on our social media and here on our blog. We also encourage you to subscribe to our email blast HERE. Creative Art Works is reinvigorating West 138th street between Hamilton Place and Amsterdam, just down the hill from City College of New York, with a new mural connecting the Jacob Schiff school campus with the local community. This new mural will replace CAW’s 2011 mural, Magic with Logic, which was damaged by school construction. This 179-foot mural joins other notable CAW works in Hamilton Heights, including the adjacent Dreams of a Creative Revolution, three murals commissioned by West Harlem Group Assistance, and several works in Riverbank State Park. CAW has been providing arts programs in the school building since 2011, most recently with in-school classes and out-of-school time programming at Hamilton Grange Middle School. Teaching Artist Lenny Correa is an artist, muralist, curator, and community organizer. He has created numerous works of public art, including the five-story Audubon Mural at the corner of 155th Street and Broadway. Teaching Artist Assistants Becky Hutt and Sophie Mendelson have been assisting Teaching Artist Max Allbee at Hamilton Grange's in-school art class. Join us for the unveiling: Wednesday, August 10th, 2:00 PM. Reception with light refreshments to follow. Our third PAL mural will be painted on the north-facing wall of the adjacent to our 2015 Art of Jazz. The youth-created art conveys PAL’s mission and builds stronger connections to the community. PAL celebrates the power of the arts by partnering with CAW on Saturday workshops for school-age children and by collaborating on juvenile justice programs. Teaching Artist and East Harlem Resident Kristy McCarthy is a founding member of the Harlem Art Collective and The Laundromat Project. Teaching Artist Assistant Jenna Kilman is a licensed Art Therapist. This is the first mural project with CAW for both of them. Join us for the unveiling: Wednesday, August 10th at 10:00AM. Reception with light refreshments to follow. CAW Youth Apprentices are creating our fourth mural for West Harlem Group Assistance on the Northwest corner of 142nd Street and Lenox Avenue, half a block north of Communities for Healthy Food. CAW celebrates WHGA’s commitment to revitalizing communities and affordable housing. This mural will help promote this food pantry and its related services to West Harlem residents. Teaching Artist Beata Drozd has taught Saturday Workshops at PAL Duncan Center, Westside Commons and El Barrio's Artspace PS109. She also developed the Anatomical Illustration Lab at A. Philip Randolph Campus High School. Join us for the Unveiling: Tuesday, August 9th, at 2:00 PM. Reception with light refreshments to follow. Global Community Charter School commissioned Creative Art Works to visually express on the façade of its new home its principles unity, diversity, freedom and fun. The progressive school, which recently moved into a repurposed commercial building, known as Harlem Self-Storage, is pleased to engage CAW and local youth to create a mural that will welcome neighborhood children to its diverse student body. Teaching Artist Gera Lozano returns to the Youth Employment Program for her fifth mural project. In past years, she has lead teams on Gardens of Steel, Hope Communities, Harlem Sunrise and Art of Jazz. Teaching Artist Assistant Erin Fritts worked at the Saturday Art Workshop at United Palace of Cultural Arts. Teaching Artist Yael Tsoran is an Art Therapy and Painting major at Arcadia Universtiy. Join us for the unveiling: Tuesday, August 9th, at 10:00 AM. Reception with light refreshments to follow. 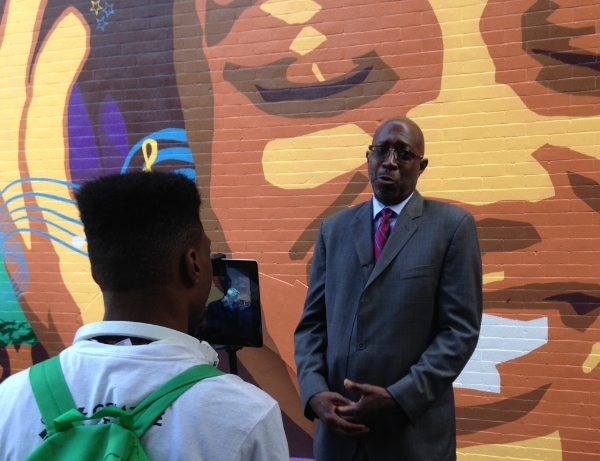 Youth Apprentices from the Multimedia Team interview Executive Director Donald Notice of West Harlem Group Assistance, at the unveiling of the 2015 mural, Harlem Melody. This roving team of photographers, videographers and reporters will be documenting the art-making process and capturing the stories and experiences of all our summer Youth Apprentices. The Multimedia is lead by Teaching Artists Anissa Hanley, Duron Jackson and Elizabeth Orr. We are happy to have Teaching Fellow Shante Richardson join us from Citizen Schools through AmeriCorp Vista. We will feature the Multimedia Team in an upcoming blog. Join us for the unveiling: Thursday, August 11th, 5:30 - 7:30 PM. At the Oberia Dempsey Multi-Service Center, 127 W. 127th Street in Harlem. CAW has been contracted by the NYC Administration for Children Services (ACS) to employ Youth Apprentices to create large-scale murals and multimedia collateral for juvenile detainees. Site visits to these secure facilities require advanced approval.